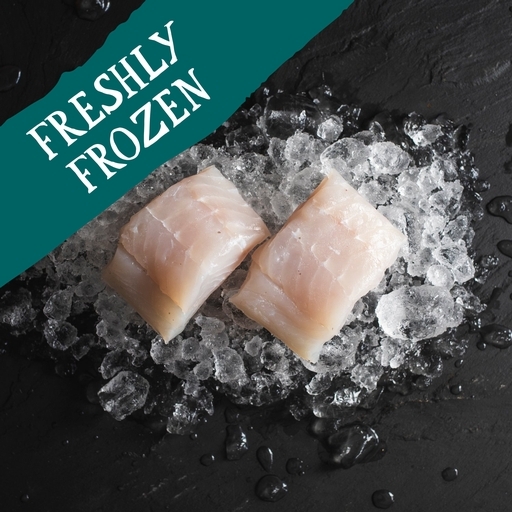 Our wild pollock, line-caught by small inshore boats, is a fantastic sustainable alternative to its close relative the cod, with clean white flesh that stays firm and flakes beautifully when cooked just right. We’ve cleaned, prepared and portioned these two fillets – and left the skin on, because crispy fish skin is one of life’s great culinary joys. But if you prefer, the skin can be very easily removed after cooking – or before, by laying the raw fish skin-side down and running a sharp knife between flesh and skin. These fillets are best pan-fried for perfectly crisp skin. It takes a hot pan and minimal intervention - resist the urge to poke and prod. Heat 2 tbsp of oil in the frying pan. Season the fish well on all sides. Fry them, skin-side down, for 3-4 mins, until the skin is golden. Gently flip and cook for 1 more min. Add a squeeze of lemon and remove from the heat. Let them sit in the pan for 2 mins to gently finish cooking. If the fillets are particularly thick or thin, you may need to add or subtract a minute of cooking time. Alternatively, you can bake them in a hot oven for 10-12 mins at 200˚C/Gas 6, either directly on a roasting tray or wrapped in a foil parcel with some aromatic herbs and a knob of butter. Prepared in a kitchen where nuts, sesame, Fish, Shellfish, Crustacea, Molluscs, Cephalopods, Eggs, Dairy, Gluten, Celery, Mustard and Soya are also handled.